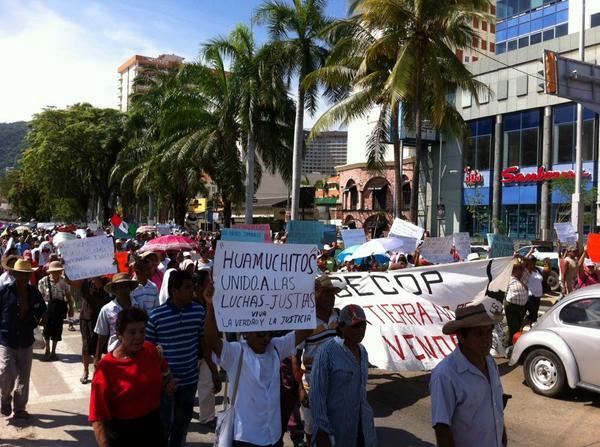 On 15 August, in observance of the eleventh anniversary of the Council of Ejidos and Communities Opposed to La Parota Dam (CECOP), thousands of campesin@s marched in Acapulco together with members of national and state social organizations, making for a mobilization in which nearly 3000 persons particiapted. The principal demand of the protestors was to demand the release of one of CECOP’s spokespeople, Marco Antonio Suástegui Muñoz, who was arrested last June. In parallel terms, protestors demanded justice in the case of the other political prisoners of the state, such as Julio Ventura Ascencio and Emilio Hernández Solís, also CECOP members, in addition to the commanders of the Regional Coordination of Communal Authorities (CRAC): Nestora Salgado, Arturo Campos, and Gonzalo Molina. This entry was posted on Tuesday, September 2nd, 2014 at 3:33 pm and is filed under Disappeared, Guerrero, Human Rights, Human Rights Defenders, Indigenous people, Justice system, Land and Territory, Land rights, Militarization, Political Prisoners/Prisoner of Conscience, torture, Women, Youth. You can follow any responses to this entry through the RSS 2.0 feed. You can leave a response, or trackback from your own site.